2016 Mazda CX-3 Pros and Cons: Why (Not) This Car? If you're among the increasing number of people who realize that a small crossover is all the car they really need, then you suddenly have many to choose from ranging in character from functional and economical (Honda HR-V) to somewhat luxurious (Buick Encore) and from off-road-ready (Jeep Renegade) to track-ready (Nissan JUKE NISMO RS and MINI JCW Countryman). What sort of high-riding pint-sized vehicle are you seeking? The answer to this question will determine whether the latest entrant into this new-yet-already-crowded segment, the Mazda CX-3, is the best car for you. The Mazda probably will be cross-shopped most often with the Honda HR-V, but is closest in character to the non-NISMO Nissan JUKE, so I'll pit it against both. The CX-3's interior is even sportier than its exterior. Artful use of red elements. Why the 2016 Mazda CX-3? The Mazda CX-3 handles at least as safely as the Honda HR-V. Overcook a turn, and it scrubs off speed with safe understeer while maintaining your specified line. Short of the outside front Yokohama Avid's middling limits, the CX-3 feels balanced, poised, and precise despite carrying 60 percent of its weight on its front tires. Unlike Nissan with the JUKE, Mazda hasn't resorted to brake-based torque vectoring to cheat physics. Somehow they've achieved more balance and poise than you'll find in the Nissan (especially the non-NISMO trims) through drivetrain and suspension design. I haven't driven the front-wheel-drive CX-3. It might feel less athletic. Compared to the HR-V and the non-NISMO JUKE, the CX-3 also leans less in moderately hard turns. A lower height contributes. The HR-V and JUKE aren't as tall as the typical crossover, but they're 2.5 and 1.1 inches taller than the CX-3, respectively. In fact, at 60.7 inches the CX-3 barely crosses the line that separates crossovers from cars. The related Scion iA (essentially a Mazda2 sedan) is only a couple inches lower. A Chevrolet Trax or Jeep Renegade is nearly a half-foot taller. As is the typical compact crossover, such as Mazda's own CX-5 (65.7 inches). The numbers don't tell the whole story. From the driver's seat, the JUKE feels taller than it is, while the CX-3 does not. The JUKE has the driving position and moves of a crossover, while a CX-3 handles more like a regular car than a crossover. Beyond the objective capability of its chassis, the CX-3's steering and suspension provide more nuanced feedback than you'll experience in competitors, especially those (such as the Honda and GM utes) that prioritize insulation from the outside world. It's always evident what the tires' contact patches are up to, making the CX-3 easy and enjoyable to hustle along a curvy road. Though both the JUKE and the CX-3 feel much more nimble than the others, they differ in character. Even in NISMO form, with tighter steering and a firmer suspension, the JUKE's responses don't seem as natural or as intuitive. It's fun to run the snot out of, while the CX-3, affording a more seamless connection between car and driver, is the better dance partner. The JUKE (at least in NISMO form) is the better choice for switchbacks or a track, yet the CX-3 is more enjoyable in typical daily driving. Such sporty handling deserves sporty styling, and here the Mazda CX-3 also delivers. Outside, the combination of an unusually long hood (to provide space for large intake and exhaust manifolds) with a bobbed tail yields classically sporty proportions. Think shrunken Infiniti FX (now QX70). Yet the proportions don't work, at least not for me. Especially with the 16-inch wheels on the Sport and Touring trims, the front overhang appears disproportionately long. Wide black cladding around the wheel openings doesn't help. While this cladding might communicate that the CX-3 is a crossover, it also makes these openings appear far larger than they are, visually shrinking the wheels. The Grand Touring's 18-inch wheels partially compensate, but even they would look better if paired with body-color cladding. The Honda and Nissan also have black wheel-lip moldings, but in their cases these are thinner and appear much less clunky. In addition to the cladding, the CX-3's curves aren't quite right. Do they verge on cartoonish, as the second-gen FX's have? Overall, the HR-V's exterior appears more polished and cohesive, if not quite as sporty. The Nissan JUKE is a different animal altogether. As intended, its quirky exterior styling polarizes. Nothing else looks like it. Many people can't stand the look of it. Inside, the CX-3 makes a more thoroughly positive impression. The styling is sportier than the HR-V's, yet also unexpectedly sophisticated. With the exception of a pointed instrument cluster hood, Mazda eschewed the sort of quirky details you'll find inside the campy Nissan, with its motorcycle gas tank-inspired center console and funky, boombox-inspired "Integrated Control System" interface. Padded-and-stitched surfaces on the doors and along the face of the instrument panel take the CX-3's interior a little upmarket, while red elements take it in a sporty direction. The cloth center panels of the otherwise leatherette seats add further visual interest. Very nicely done. Yet you still won't feel like you're in a more expensive vehicle. The moment you pull the Mazda's door closed you know you're in a light, inexpensive car. Also, while the CX-3's interior might be full of details usually limited to more expensive cars, you can tell that the top of the instrument panel and the upper surface of the doors are hard plastic even without touching them. The HR-V and some other competitors (but not the JUKE) feel more substantial, partly because they are. While other small crossovers can weigh nearly 3,400 lbs., the CX-3 (like the smaller JUKE) tips the scales at under 3,000 lbs. even when fitted with all-wheel drive. The CX-3 looks most like a compacted Infiniti FX from the rear quarter. Fashionable hidden pillar. The controls are well-designed. The instruments are not. Nearly useless tach. You might expect a small, light vehicle to go farther on a gallon of gas, and here as well the Mazda CX-3 doesn't disappoint. With front-wheel drive, the CX-3 earns EPA ratings of 29 MPG city, 35 MPG highway. The city rating is one MPG higher than the HR-V's, while the highway rating is a tie. When fitted with all-wheel drive (AWD), both models still manage 27/32. The JUKE isn't far behind: 28/32 with FWD and 26/31 with AWD. A Fiat 500X, though not as quick as the CX-3 and fitted with a nine-speed automatic transmission, lags well behind in city driving with 21/30. In my real-world suburban driving I had little trouble exceeding the EPA city figure, with trip computer averages usually around 30 and as high as 36. The HR-V's trip computer reported numbers two or three MPG higher in the suburbs, but this could be because it has an Eco mode that facilitates hypermiling. Even in its regular mode the Honda doesn't encourage inefficient driving the way the Mazda does. On a 70-MPH highway the trip computers in both vehicles reported averages around 33 or 34, a bit better than their EPA ratings. Small crossovers are often bought for young drivers, for the parents of whom safety is a top priority. The IIHS hasn't crash-tested a CX-3 or HR-V yet, but other recent Mazdas and Hondas have scored well. The Nissan scored well in all of the IIHS's crash test except the small offset crash test, where like many models introduced before the 2013 model year it scored poorly. The Honda, Nissan, and Mazda all have a rearview camera as standard even on their lowest trim levels. Unlike the HR-V and the JUKE, though, the CX-3 offers many of the latest safety features. Even the mid-level Touring has standard blind sport warning and rear cross-traffic alert. A package that includes a full array of collision warning systems, automatic braking, and adaptive cruise control is optional--but only on the Grand Touring. Honda and Subaru have started offering similar safety packages on the lesser trim levels of many models (if not the HR-V). Hopefully Mazda will soon follow their lead. The CX-3's driving position is very good, more car-like even than the HR-V's. The view forward is open. The view rearward, not so much, as the racy styling yields rear windows that are quite a bit smaller than the front ones. To help compensate, the outside mirrors are large plus blind sport warning is standard on the Touring and Grand Touring. The CX-3's driver seat is very comfortable and provides good lateral support in turns. The cloth center pocket is cushy without being mushy. Unlike in the HR-V and some others, the headrest does not jut uncomfortably far forward. But the lumbar bulge is not adjustable. As is, it fit my back well, but many people will wish for more of a bulge. The HR-V's also non-adjustable lumbar bulge was too pronounced for my taste. The JUKE's seats are comfortable, but for effective side bolsters (and then some) you must step up to the NISMO. Worth noting for those of you who get your coffee to go: the cup holders are located beneath the armrest (optional on the Sport, standard on the others). If you want to use them, then you can't use the armrest. Why Not the 2016 Mazda CX-3? As noted when discussing safety, you can get more safety features on the Mazda CX-3 than on most competitors (the Jeep and Fiat excepted). A Technology Package on the tested Touring includes a sunroof, Bose audio, and heated seats. The Grand Touring adds as standard this package, 18-inch wheels, steering-linked LED headlights, automatic climate control, navigation (a $399 dealer option on other trims), and leather seats with synthetic suede center panels. What more could someone want on such a vehicle? Perhaps a power driver seat. One is offered on competitors from GM and Fiat-Chrysler, and their power adjustments include one for lumbar support. The FCA utes also offer a heated steering wheel and rain-sensing wipers. But are any of these deal-killers? The absent feature that will send some (but not many) potential buyers elsewhere is a manual transmission. You can get one on the Honda (though not with leather or nav), Nissan (though NISMO FWD only), Fiat, and Jeep, and on most other Mazdas, but not on the CX-3. This is a shame, as the CX-3 would be evern more engaging and enjoyable with a manual. I haven't rated the CX-3 against the HR-V on feature availability because I've focused on a single feature. For people who have no interest in a manual transmission (the great majority), the Mazda CX-3's largest shortcoming is a rear seat that is tight even by small car standards. Sitting behind my 5-9 self, my knees pressed lightly against the front seat backs. I wasn't uncomfortable, but felt a little closed-in. A shame, as rear headroom is relatively plentiful and the rear seat is otherwise very comfortable. The HR-V provides about four inches more rear legroom, a big difference. According to their specs, the JUKE has three inches less rear legroom than the Mazda. In reality, though, I had perhaps an inch more rear knee room, but less rear headroom. The Nissan's rear seat might be slightly more adult-friendly than the Mazda's, but neither is a good choice if people taller than me will be sitting in both rows. Similar face to other current Mazdas. Does the large grille over-promise? An unusually tight rear seat for a vehicle with rear doors. As implied by its bobbed tail, the CX-3 also lags the segment average in cargo capacity. The Honda HR-V can fit about twice as much behind its rear seat (24 vs. 12 cubic feet), and can also hold considerably more than the Mazda with both rear seats folded (59 vs. 45 cubic feet). Honda cleverly designed the rear seat in the HR-V (as in the Fit on which it is based) to form a low, level floor when folded. The folded rear seat in the Mazda angles upward. Also, for some reason the CX-3's rear opening stops a few inches above its cargo floor. Perhaps for structural rigidity? If you like to slide your heavy cargo straight out the back rather than having to lift it over a significant lip, the Mazda won't work for you. Some competitors offer a front passenger seat that folds forward to further extend the cargo floor. The Honda's instead reclines backward, while the Mazda's cannot adjust far enough in either direction. As tight as the Mazda's cargo area is, the Fiat 500X's is somewhat tighter, and the Nissan JUKE's is much tighter. All three sacrifice cargo capacity for the sake of sleek styling. If you want to carry a lot of stuff in your small sporty utility, get one of the square ones. Or the HR-V. The Mazda CX-3 doesn't ride as smoothly as the Honda HR-V or Chevrolet Trax. Though only harsh on the worst roads (e.g. washboard), the CX-3's suspension often feels moderately firm, and occasionally transmits a bump that some others would more effectively absorb. Noise levels aren't high. The CX-3 shouldn't prove tiresome on the highway. But some competitors are more hushed inside. If you want a small crossover with a more luxurious character, check out the Buick Encore. The Mazda CX-3's controls are generally very well designed. The console-mounted knob and buttons that control the infotainment system are mounted a bit too far rearward, but they are otherwise easy to understand and operate. One tweak I'd like: a way to change audio channels or pause a CD that didn't require a couple twirls and clicks. If you are listening to a CD and tap the volume knob to mute the system, the CD keeps on playing--you just can't hear it. (Hint to Mazda: take yet another look at Audi's MMI.) Three large conventional knobs control HVAC functions. My main issue is with the instruments of the Sport and Touring. The small monochrome LCDs that flank the analog speedometer wash out in sunlight, especially the one on the left, which includes the tach. It's a good thing the automatic transmission is so smart, and perhaps even that a manual isn't offered, because this tach is never easy to read, and is often completely illegible. On the Grand Touring a large analog tach with an inset digital speedometer replaces the analog speedometer, avoiding this issue. The Mazda CX-3 can seem quick or not quick depending on which competitors you're comparing it to and what you're trying to do with it. Like its chassis, the CX-3's powertrain feels best at 8/10 of its potential. The 146-horsepower 2.0-liter four-cylinder engine has a healthy midrange. Depress the accelerator most but not all of the way to the floor and the CX-3 accelerates briskly with no sense of strain. Pressing the acclerator the rest of the way to the floor makes the car even quicker, but not to nearly the extent that it makes it louder. Still, the CX-3 can get from a dead stop to 60 MPH in about eight seconds. This is over a tick quicker than the HR-V and Trax. It's also quicker than the 180-horsepower Fiat and Jeep, as they're also much heavier. If the comparison were limited to the above models, the CX-3 would be the quickest. But the Nissan JUKE, with a 188-horsepower 1.6-liter turbocharged engine and just a couple hundred pounds more curb weight, can get to 60 about a second ahead of the Mazda. As can a turbocharged MINI Countryman. The JUKE's engine doesn't really hit its stride until about 4,000 rpm, though. In typical daily driving, the Mazda feels at least as strong and responsive. Mazda offers a related 2.5-liter four-cylinder engine AND a manual transmission in most of its other models. Allegedly the larger engine won't fit in the CX-3 (though space appears plentiful under its unusually long hood) and there's not enough demand to justify offering a manual (more believable). The solution without traveling to a different dealer: get a Mazda3 s hatchback (unless you need all-wheel drive). Transmissions warrant discussion. Both the HR-V and JUKE have continuously variable transmissions. Though CVTs can place the engine at the optimal rpm for either performance or fuel economy (or a specific combination of the two) and hold it there as the car accelerates, this can feel odd and sound worse. The loud buzzing of the Honda engine when held steady at high rpm is my least favorite aspect of the HR-V.
Mazda has chosen to buck current auto industry trends by sticking with a six-speed automatic transmission, though not an entirely conventional one. This "SKYACTIV" transmission only unlocks its torque converter at low speeds, for smooth launching and creeping. Otherwise the torque converter remains locked and the transmissions shifts like an automated manual, benefiting both performance (through quick shifts) and efficiency. Good in theory, it's also good in practice, almost always selecting the optimal ratio with quick, decisive shifts and no odd hunting. Though I used the shift lever to hold second or third through some curves, this was more through choice than necessity. I also found little use for the transmission's sport mode. The Grand Touring adds shift paddles, but there's very little need for them. Mazda offers the CX-3 in three trim levels, the $20,840 Sport, $22,840 Touring, and $25,870 Grand Touring. All-wheel drive is a $1,250 option on all three. The tested Touring included a $1,410 Technology Package (Bose audio, sunroof, cargo cover) and $399 dealer-installed nav funcitonality (via an SD card, also available on the base trim). If you want a sunroof and nav, then you should probably spend another $1,221 for the Grand Touring, as this adds features worth over $2,400 (see "feature availability" for the details). Also, you can get a $1,920 package of "i-ACTIVESENSE" safety features only on the Grand Touring. The larger CX-5 lists for about $3,000 more, a meaningful difference. But if you're more interested in interior space than an elevated seating position or all-wheel drive, the Mazda3 hatchback costs about the same as the CX-3. Pricing relative to the Honda HR-V depends on trim level. The CX-3 Sport and HR-V LX are priced and equipped similarly. The CX-3 Touring with Technology Package costs about $1,400 more than the HR-V EX, though their content is similar. But specify the top trims then adjust for the Mazda's additional content, and the CX-3 Grand Touring actually undercuts the Honda EX-L by about $300. Compared to the Nissan JUKE (2015 because 2016 prices haven't been released yet), the CX-3 starts $835 lower than a JUKE S before adjusting for feature differences and about $500 lower afterwards. Specify sunroofs on both and the CX-3 Touring with Technology Package lists for $525 more than a JUKE SV before adjusting for feature differences and about $300 more afterwards. Opt for the top trim levels and the CX-3 Grand Touring lists for $645 less than a JUKE SL despite including nearly $1,000 in additional content. All of these comparisons include AWD, which costs about $500 more on the JUKE, likely owing to the Nissan system's inclusion of a torque-vectoring rear differential. Also, the $1,250 both Mazda and Honda charge is on the low end for AWD. If you want the performance and handling upgrades of the 211-horsepower JUKE NISMO RS, then you'll have to spend quite a bit more. With AWD, this model lists for $3,725 more than a CX-3 Grand Touring despite lacking many of the Mazda's features (including LED headlights, a sunroof, a head-up display, and heated front seats). All of these comparisons suggest that the CX-3 Touring isn't as competitively priced as the Sport and Grand Touring. Why not, Mazda? Compared to the Honda HR-V, the Mazda CX-3 has some clear advantages and disadvantages. Its rear seat and cargo area aren't nearly as roomy, but it has a more stylish interior, it's quicker, it handles better, and it's simply much more fun to drive. Either car should be reliable and fuel efficient. The Nissan JUKE, in contrast, largely shares the CX-3's strengths and weaknesses. Its styling is more controversial, its chassis has less inherent ability, and its cargo area can't even hold as much as the Mazda's, but it's quicker (at least when driven hard) and more distinctive. Plus, if you want something hotter than the regular car, Nissan offers the JUKE in NISMO and NISMO RS forms with aggressively bolstered seats, tighter steering, and firmer suspension tuning. Mazda offers no equivalent. This is a shame, as the CX-3's all-wheel-drive system and suspension have so much inherent goodness that they deserve to realize their full potential. With the current engine, current suspension tuning, and current tires, the CX-3 is thoroughly enjoyable up to 8/10. Push it harder and it doesn't do anything scary. It just runs out of grunt and grip and has the outside front tire clearly (yet quietly) communicate that you've reached the limit. In my personal car, I'd want more potential for thrills along a challenging road. Plus a manual transmission. But you might not feel the need (or even have the occasion) to push a small crossover hard. You might just want something stylish, with a slightly elevated driving position, in which to thoroughly enjoy typical daily driving. At a reasonable price, with good fuel economy, and perhaps the latest safety tech. If so, then the Mazda CX-3 is a top contender, and quite likely the best car for you. Neatly assembled engine delivers good power and better efficiency. Unlike the HR-V's, the CX-3's rear seat doesn't fold low or nearly level. Mazda and Honda each provided an insured car for a week with a tank of gas. 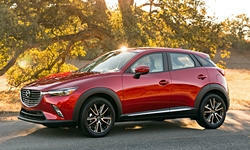 2016 Mazda CX-3 pros and cons, according to Michael Karesh: the best reasons for buying (or not buying) the 2016 Mazda CX-3. Join TrueDelta to post your own impressions. Nice review Michael. One issue: "moment you pull the Mazda's closed". A new Mazda6 wagon would be nice. So it appears this really only exists because the market demands it. The Mazda 3 makes more sense in almost every way. It's a shame people are so dumb, but what can ya do? :P Anyway, nice review, Michael. In Alaska, where the Mazda3 makes no sense, the CX-3 is a reasonable alternative. Most folks buying a Mazda3 are commuters and first time buyers with limited needs... the CX-3 can easily take the place and look good doing it. An additional comparison I would make is with Subaru's XV Crosstrek. It's a worthy competitor and may offer advantages to all the contendors on this list. The XV Crosstrek is an in-between vehicle, much longer than most of the crossovers with which it competes, but not as tall (unless you're comparing the also not-tall CX-3). For these reasons it also has more legroom and cargo room than most. I haven't personally given the XC Crosstrek much attention because it's essentially an Impreza hatchback with a slightly lifted suspension and cladding, for an extra $1,500. But I'm swimming against the current. It's been a very popular vehicle, and I should probably test one. Sorry,I guess I meant to saythisis pointlessfor 99% of people. Michael. I think you nailed it with your comment The solution without traveling to a different dealer: get a Mazda3 s hatchback (unless you need all-wheel drive). Better fuel economy, better handling, manual, and lower starting price.